Bronze Age tanged and collared chisel of Late Bronze Age date, probably of Wilburton or Ewart Park metalworking industry, corresponding with Needham's (1996) Periods 6-7, dated to 1150 - 750BC. The chisel is incomplete missing nearly all the tang (with a surviving length of 50.8mm and a weight of 19.0g). The surviving part of the tang is short (at 3mm) and appears to be of sub-square section. The tang gradually widens to define a flanged shoulder/ "collar" moulding of sub-oval form, probably worn (15.2mm long and 13.3mm wide) and gradually narrows below the flanged shoulder. The sides of the blade are curved and divergent to produce a curved blade edge (with a blade width of 33.7mm). The original blade edge has been lost with no definite evidence for differential wear across the blade edge. The blade faces are flat and thin gradually towards the edge (with a thickness of 3.7mm below the shoulder and 0.8mm above the edge) and with the suggestion of subtle blade facets on each face (5mm from the blade edge). The surface is heavily-pitted and corroded with a dark-green to brown patina and no surviving evidence for sharpening striations on the blade. Tanged and collared chisels typically date from the Late Bronze Age to Early Iron Age (Llyn Fawr period). An example dating to the Wilburton/Wallington phase is known from Doncaster, Yorkshire (Burgess 1968, 19, fig 7,2; Burgess, Coombs and Davies, 1972, 217), though the main currency is during the Ewart Park phase (c.900-700 BC) into the subsequent Llyn Fawr period (c.700-600 BC). Tanged and collared chisels have a broad distribution across northern France, Britain and Ireland (see Coffyn et al. 1981, 202-203, Carte 7), though there are relatively few examples from western England and Wales. 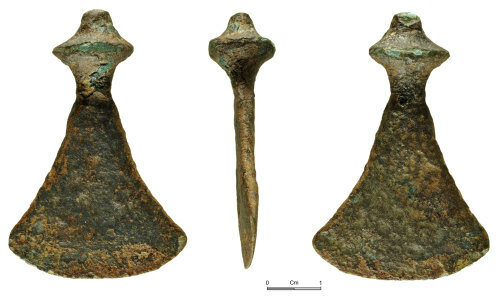 A very similar example with a thick collar and triangular blade can be seen in the large Ewart Park phase Nottingham Hill hoard, Gloucestershire (Gingell 1974, 308, fig 4,22), as well as a single find from Leigh Woods, Bristol (MacGregor 1987, 109, 11.65). Another example was found at Brogyntyn, Shropshire (Savory 1980, No 288.3) associated with a socketed gouge and a fragmentary Hallstatt 'C' sword.